Cathy is a founder member of Stringwise. In 1985 she was accepted as a trainee teacher on the Tower Hamlets String Teaching Project where she met Sheila Nelson and the other members of the team with whom she was to go on to found Stringwise and co-write the Millennium Award winning Essential String Method, published by Boosey & Hawkes. Over the years Cathy has been both a director and trustee of Stringwise and directed various courses. She plays the double bass professionally and has some experience on the viola, which she started learning at the age of seven and continued to play even after the bass had become her ‘first’ instrument. Cathy studied the double bass whilst at university and later graduated from the Santa Cecilia Conservatoire in Rome. She started training with the Tower Hamlets Project immediately she returned from Italy and was one of the pioneer double bass teachers of young children on the small instruments that only became available from the 1980s. Indeed, inspired by the Chamber Music in Tower Hamlets, she was the first to write quartets for beginner bass players who up until that time, were regularly excluded from string chamber music. 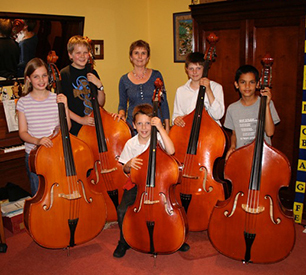 Cathy has also written a number of tutor books for young bass players and publishes repertoire that the more mainstream publishers find uneconomic to produce. She has worked with Boosey & Hawkes on a number of publications and is a consultant for both the ABRSM and Trinity Examination Boards on graded and diploma repertoire, scales and sight-reading. Cathy is a member of The Academy of St Martin in the Fields, co-principal bass of the London Mozart Players, principal bass with the Rambert Orchestra and frequent guest player with the BBC Symphony Orchestra. She has a thriving teaching practice with students at all ages and stages. In 2009 she was recognized as a Young Bassists Ambassador by the International Society of Bassists and in 2014 was presented with an award for Exceptional Services to the European String Teachers’ Association.